One of nights during our trip, we were wandering around the streets of Causeway Bay, when I realized that everyone passing by me in the streets had a delicious looking popsicle in their hand. 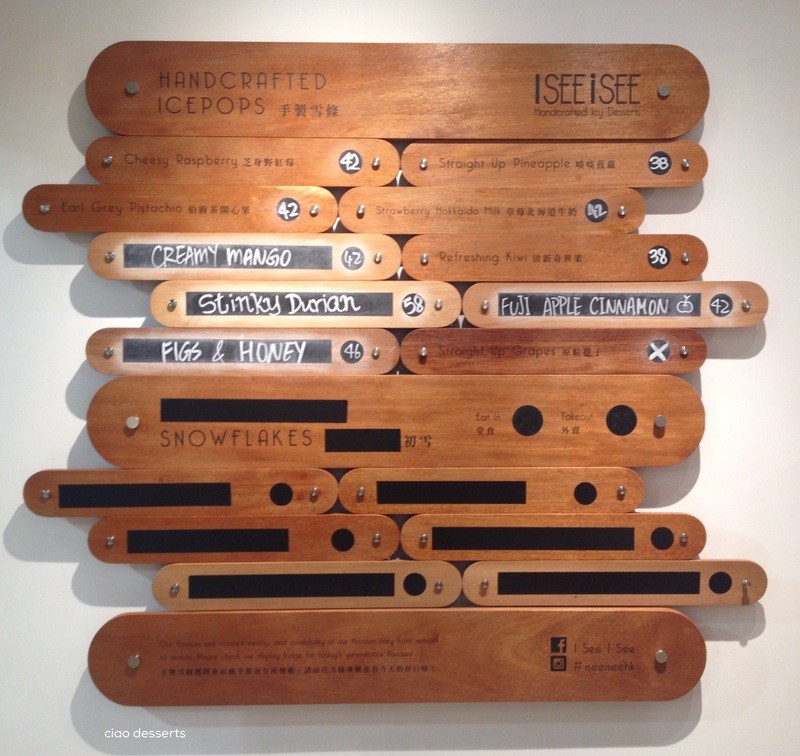 We followed the crowd, and happened upon this adorable shop called “I see, i See,” which sells handcrafted popsicles! 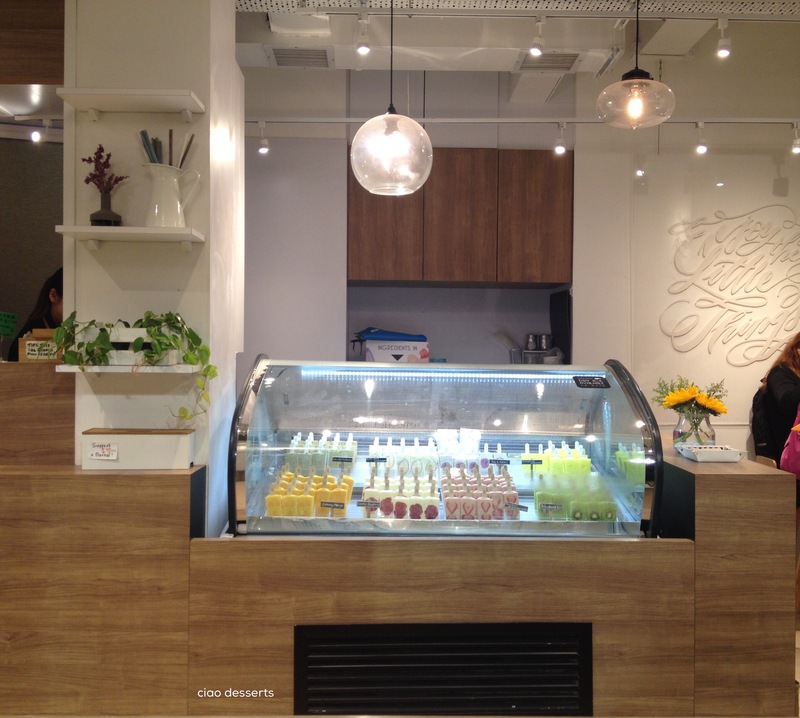 The interior is airy and bright, and you can see the menu right when you walk into the shop. There are basic flavors, and also special seasonal flavors, which are written in chalk. After I got back to my hotel room, I did a little research, and found out the popsicles are made in small batches, out of all natural ingredients, with no artificial flavors, coloring, or preservatives. They are also made using a quick freeze method, which freezes the popsicles quickly, and gives them a smooth, ice-chip free, velvety texture. Don’t these popsicles look absolutely tempting? After you decide which flavor you want, they hand it to you in a cute, brightly colored paper cup. This is such a thoughtful touch, to catch any drips and dribbles, or just for you to put your popsicle down for a second in case your hand gets tired. 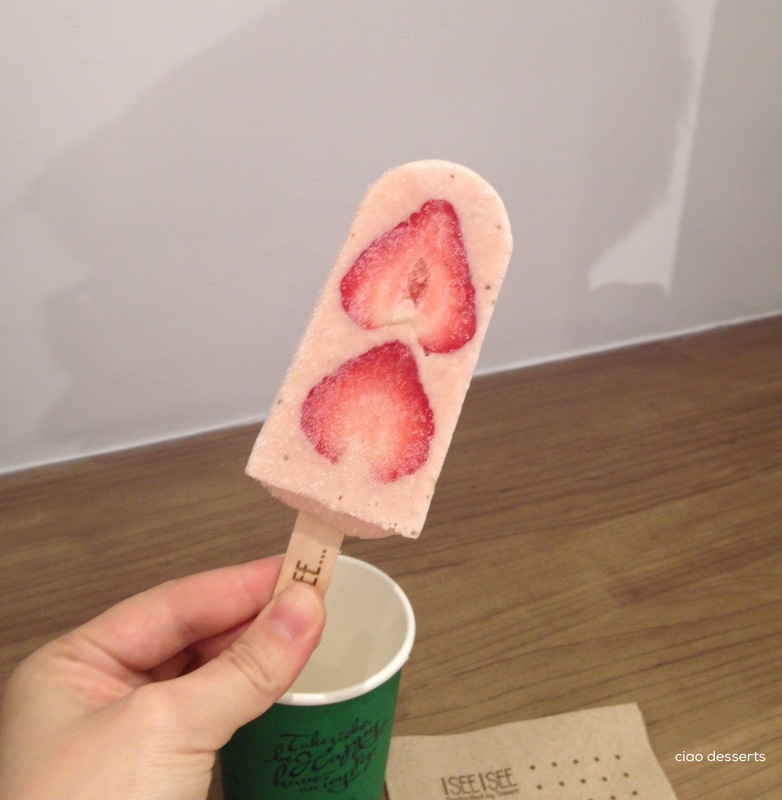 I ordered the Hokkaido Milk and Strawberry popsicle, and my friend ordered the fig one. The texture was perfectly smooth, with no ice chips, and the flavor was just the right balance of creamy milk, sweet and tangy strawberry. This is probably also the most photogenic popsicle, ever! If you want to read about the other foods I enjoyed in Hong Kong, please go here! 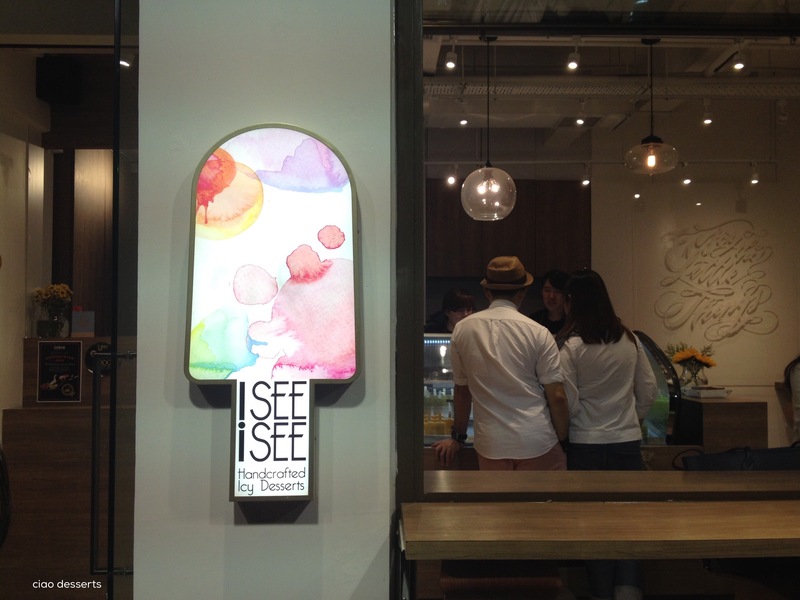 Information: I See, I See | Haven Court, 136 Leighton Rd, Causeway Bay, Hong Kong| Phone: 852 2337 3361 |Hours (Causeway Bay) : Sun-thurs: 11:30-22:30, Fri-Sat & PH: 11:30-23:-30. This entry was posted in Uncategorized and tagged all natural, Hokkaido, Hong Kong, I See I See, ice cream, icy treat, popsicles, strawberry, summer. Bookmark the permalink.